If I’ve been picking on Doctor Who a bit in this series, it’s certainly not out of a lack of affection. Instead, it’s a testament to the show’s longevity; over 48 years, it has spawned enough outer space terrors to fill several Monster Manuals. And the notoriously low budgets of Who‘s early years ensured that a fair number of them would be among the laughing stocks of interstellar villainy. The Fourth Doctor encountered such do-it-yourself baddies as the bubble-wrap larvae of the Wirrn and the crackling cellophane of the Vardans. The Third Doctor’s era counted among its lowlights the bouncing blobs of the Ogron god and the Gell Guards. The Quarks, the Ergon, Meglos and the mutant clams of the planet Skaro further filled out the ranks of the risible. 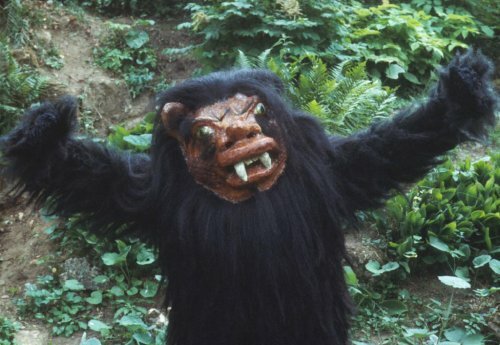 Making a brief appearance in the 1978 serial “The Androids of Tara,” the Taran Wood Beast shambled into view to threaten the Doctor’s friend Romana. At least the bubble-wrap larva was a clever, if unconvincing, attempt to create an unusual creature. The Taran Wood Beast was clearly a Halloween-store fur costume topped with a googly-eyed, paper-mache mask and inhabited by a twitchy stagehand.